This article is about the summon stone. For the SR character, see Ranko Kanzaki. This young girl is awaked by a power from another world, following the forbidden melody of the exalted black wings. Wrapped in a pitch black veil, the true demon ruler descends from the twilight sky. 30% boost to Mysterious weapon skills. 50% boost to Mysterious weapon skills. 66% boost to Mysterious weapon skills. Revel at the unbridled power of my cohorts!6% boost to iDOLM@STER characters' ATK. Massive Dark damage to all foes. Bonus Fire and Water damage. 9T9 turn cooldown. 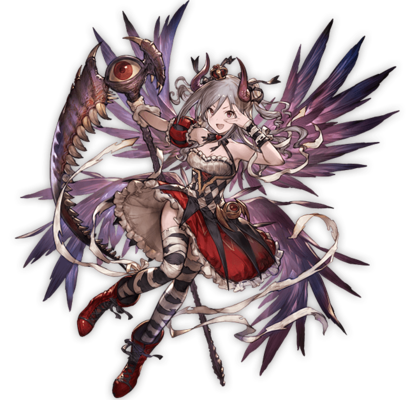 Completing [Skybound] Ranko Kanzaki's final uncap recruits the 02 character Ranko Kanzaki. The trophies to obtain [Skybound] Ranko Kanzaki can be earned by calling a support summon Brunnhilde, you do not need the summon yourself, and the corresponding event does not need to be running. The other two items are obtained from special cross-fate episodes with other idolmaster characters at max level. This page was last modified on 3 February 2019, at 19:52.